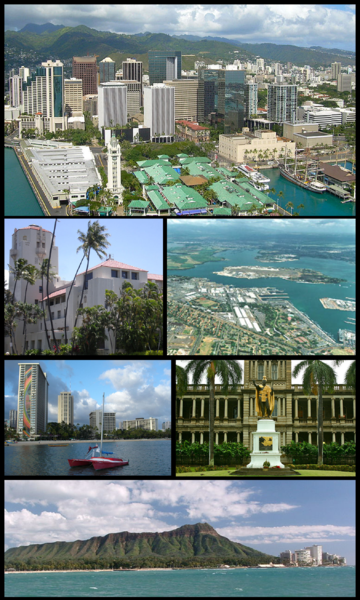 Honolulu ">[honoˈlulu]) is the capital and largest city of the U.S. state of Hawaii. 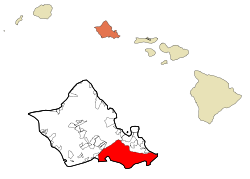 It is an unincorporated part of and the county seat of the City and County of Honolulu on the island of Oahu. The city is the main gateway to Hawaii and a major portal into the United States. The city is also a major hub for international business, military defense, as well as famously being host to a diverse variety of east-west and Pacific culture, cuisine, and traditions. Honolulu (/ˌhɒnəˈluːluː/ or /ˌhoʊnoʊˈluːluː/; [honoˈlulu]) is the capital and largest city of the U.S. state of Hawaii. It is an unincorporated part of and the county seat of the City and County of Honolulu on the island of Oahu. The city is the main gateway to Hawaii and a major portal into the United States. The city is also a major hub for international business, military defense, as well as famously being host to a diverse variety of east-west and Pacific culture, cuisine, and traditions. As of 2015, Honolulu was ranked high on world livability rankings, and was also ranked as the 2nd safest city in the U.S. It is also the most populated Oceanian city outside Australasia and ranks second only to Auckland as the most populous city in Polynesia.